The Orion, Mich., plant will retool during 2010 and will be able to make as many as 160,000 vehicles on two shifts. That will include more than 100,000 Aveos. DETROIT -- General Motors Co. will build its redesigned 2011 Chevrolet Aveo small car at its plant in Orion Township, Mich.
Mark Reuss, president of GM North America, said late Wednesday he thought the Aveo was slated for the plant, and a spokeswoman today confirmed that is the case. “It's been a long time since we've had small cars in the United States built in the United States that has had, I think, the attributes and the quality and the performance that these cars are going to have,” Reuss said on the sidelines of a Chevrolet event. Production stopped at the end of November at Orion, which made the Chevrolet Malibu and Pontiac G6. GM said in June that Orion had beat out idled GM plants in Spring Hill, Tenn., and Janesville, Wis., for production of GM's new small car. 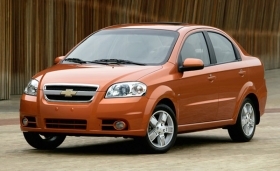 The current Aveo is built in South Korea. GM originally planned to make the redesigned vehicle in China or Mexico. But in May, GM agreed to build the car in the United States in exchange for UAW concessions in advance of the automaker's Chapter 11 bankruptcy filing. GM had not announced which small car would be built at Orion, although former North American president Troy Clarke said this summer that it was not the Spark, as had been widely reported. He said the Orion car would be the size of the current Chevrolet Aveo. The automaker has said the Orion plant, which will retool during 2010, will be able to make as many as 160,000 vehicles on two shifts.